If your financial life were like a placid lake, where you could easily see the other side, you would not need an advisor or guide to help you cross it. We feel life is more like rafting down a winding river with rocks and obstacles in your path. Having a guide who spends their life studying the financial river can help you steer clear of these obstacles providing a more enjoyable rafting experience. In other words, help you achieve the retirement you have always envisioned with as few scrapes along the rocks as possible. Vanclef Financial Group believes there are many imbalances in the economy today, including rising deficits (trade and federal), an inflated residential real estate market, volatile stock markets and currency valuations. Because of our beliefs we tend to focus on investments which have the adverse effect in these uncertain environments. Some of our investment tools, such as real estate investment trust, collateralized notes and oil and gas may be classified as “alternative” investments. Considering that ownership in real estate and other tangible geared assets have contributed to many people’s overall wealth we tend to question the label “alternative”. In fact, stocks, bonds, and mutual funds did not gain widespread popularity until the late 1930s after the various security regulations were passed by congress. 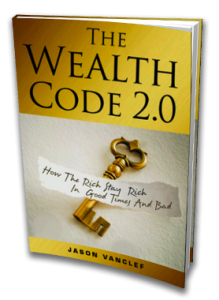 When looking at the Fortune 400 wealthiest individuals in the world, most of the individuals on the list made their fortunes from Real Estate and Oil, starting a company, or inheritance. Finally, by helping you acquire the information you need to pursue your financial objectives, we hope to establish a long trusted relationship with you. See more in the week ahead. If you are scared that all your money is in the stock market but you do not know other investments or ideas to evaluate and use for your retirement and income goals, this book is for you. No information provided on this site is intended to constitute an offer to sell or a solicitation of an offer to buy shares of any security, nor shall any security be offered or sold to any person, in any jurisdiction in which such offer, solicitation, purchase, or sale would be unlawful under securities laws of such jurisdiction. Vanclef Financial Group may only solicit or transact business with persons who are residents of the following states: AZ | CA | MD | MI | TX | WA | .Securities offered through WestPark Capital Inc. Member FINRA / SIPC. Advisory services offered through Delta Investment Management(DIM), a Registered Investment Adviser. WestPark Capital and DIM are NOT affiliated. Tax and legal services are not provided and we recommend that individuals seek professional counsel in those areas. Vanclef Financial Insurance Services: CA License #OF13092.